After learning to make the core ingredient of Indian cooking "Paneer" in the last edition, here is the recipe of my most favorite Indian sabzi (curry) Paneer Butter Masala (or Paneer Makhani). This is the most popular dish in restaurants today. Tomato Puree: Cut tomatoes into 4 pieces and deseed it with the help of a knife. Put the cut pieces into a blender and make the puree without adding water. You can also use ready-made tomato puree. Heat little butter in a pan, add cashews and fry for a minute. Add finely chopped onion and a pinch of salt and fry till it turns translucent. Transfer the mixture into a blender. Add 1/2 tbsp of sugar and 1/4th cup of cream. Blend it into a fine paste. Heat sufficient amount of butter in a pan. Add asafetida, mustard seeds and cumin seeds. Add finely chopped green chillies. Once the cumin seeds begin to crackle, add turmeric powder and then transfer the onion cashew paste into the pan. Fry on low heat. Add ginger garlic paste and mix well. Add the tomato puree, mix and allow it to boil till oil separates (8-9 mins). Now add cumin powder, red chilli powder, salt, sugar and adjust to taste. Add paneer pieces (fried if required) and mix well. Heat on low flame for 2-3 mins. Add little water to make the curry consistent. Add cream and yogurt. Mix well. Add the allimportant garam masala and kasuri methi. Heat for some time. Add finely chopped coriander leaves for garnishing & few drops of lemon extract. Remember to always check and adjust the taste before serving. It is a dish which is both sweet and spicy. Serve with Indian bread (roti, kulcha, nan) or rice. It's yummy, no doubt. Probably something you want to make every weekend to woo your loved ones and also to entertain guests. And if you are a non-Indian and expecting few Indians home for dinner or lunch, trust me this is the recipe to surprise them with. 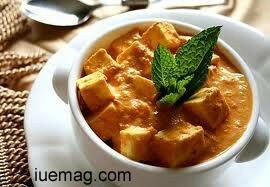 Because when you speak of Paneer Butter Masala, this is what they expect!